Objectives: Historical data have suggested that donor smoking is associated with detrimental clinical outcomes for recipients of kidneys from deceased donors. However, the effects of smoking status of a kidney donor on the outcomes of the recipient in a contemporary setting of immunosuppression and transplant practice have not yet been ascertained. Materials and Methods: This retrospective, population-cohort study analyzed data of all deceased-donor kidney-alone transplant procedures performed in the United Kingdom between April 2001 and April 2013. Our study included 11 199 deceased-donor kidney allograft recipients, with median follow-up of 46 months posttransplant. Results: In our cohort, 5280 deceased donors (47.1%) had a documented history of smoking. 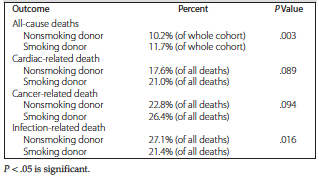 Deceased donors with versus those without smoking history were more likely to be younger (mean age of 48 vs 50 years; P < .001), be of white ethnicity (96.6% vs 95.3%; P < .001), and have brain death before donation (77.1% vs 74.9%; P = .006). On unadjusted survival analyses, overall patient survival was significantly shorter in patients who received kidney allografts from deceased donors with smoking history (hazard ratio of 1.12, 95% confidence interval, 1.00-1.25; P = .044). No significant association was seen for death-censored or overall graft survival. Our multivariate survival analyses showed that, after accounting for confounding factors, the effects of donor smoking status remained significant for patient survival (hazard ratio of 1.16, 95% CI, 1.03-1.29; P =.011) but not graft survival. Conclusions: This population-cohort study suggests that deceased-donor kidneys from smokers contribute to an increased risk of death for kidney allograft recipients. These study findings imply donor smoking history should be factored into the risk stratification decision for recipient selection to optimize decision making; however, further clarification and validation of these data are warranted. Smoking is recognized as a major global public health burden and one of the biggest causes of death across the world. Despite public health initiatives, global trends still estimate that that there will be 1.1 billion tobacco smokers in 2025.1 In the United Kingdom, nearly 1 in 5 adults (19%) aged 16 years and over were classified as smokers in 2013, and this rate has remained relatively unchanged over the past few years.2 With over one-third of the adult population in the United Kingdom on the national Organ Donor Register,3 there is a strong possibility of potential deceased donors having a history of smoking. Although the negative effects of recipient smoking on posttransplant outcomes are clear,4 data regarding outcomes for kidney allograft recipients who receive kidneys from smokers are limited. Lin and colleagues explored the United Network for Organ Sharing dataset (between 1994 and 1999) and found that smoking history in deceased kidney donors was associated with an increased risk for the recipient regarding death and graft loss.5 However, no corroborative study has ever been conducted to replicate these findings in the contemporary era of immunosuppression, and donor smoking history does not currently qualify as an extended criteria kidney. In addition, not only is it difficult to interpret historical transplant outcome data in the modern era of immunosuppression, but translating survival data between the United States and Europe may be irrelevant due to well-recognized disparities in survival outcomes between the two.6 Therefore, to better counsel our patients and risk-stratify donor/recipient selection, we urgently need up-to-date data using a large population-based cohort. In this study, our aim was to analyze data at a population-cohort level with regard to deceased kidney donors who had a history of smoking and its impact on recipient survival after kidney transplant in the United Kingdom in the contemporary era of immunosuppression and transplant care. The UK Transplant Registry (UKTR) is held by the National Health Service (NHS) Blood and Transplant, and all 23 UK adult kidney transplant centers provide mandatory data to this registry. Data for all kidney-alone allograft recipients who received a transplant procedure between April 1, 2001 and March 31, 2013 were extracted from the national UKTR data registry. During this period, there were 21 804 transplant procedures. Any patient who had received previous transplants was excluded, with just the first grafts included in the analysis, such that each case could be treated independently. Living-kidney donor transplant recipients were also excluded for this particular analysis as we wanted to focus on deceased-donor kidneys. Among deceased-donor kidney transplant recipients, 7% had unknown donor smoking status and were also excluded (assumed missing at random), leaving 11 199 cases for analyses. Data exclusions are summarized in the study flowchart (see Figure 1). Median follow-up after kidney transplant for this remaining cohort was 46 months (interquartile range, 14-84 mo). Data available for analyses included donor details, recipient demographics, and transplant-specific variables. Patient and graft survival data were available from the UKTR data and were linked to each deceased-donor kidney allograft recipient. Smoking status for deceased donors was extracted from the Electronic Offering System, which houses data collected by Specialist Nurses for Organ Donation during the organ procurement process and which feeds into the National Transplant Database. Initially, a range of variables was compared across the donor smoking status groups. Continuous and ordinal variables were analyzed using Mann-Whitney tests, with Fisher exact test used for dichotomous variables. Univariate survival analysis was then performed, using Cox regression models, with Kaplan-Meier curves to visualize the results. Multivariate Cox regression models were then produced, to account for potentially confounding factors (proportionality of hazards was checked for each variable and the whole model). Before analyses, continuous variables were converted into ordered categories to improve the model fit. The donor smoking status was then entered into a Cox regression model, and a forward stepwise approach was used to select any other variables that were significantly associated with the outcomes for inclusion in the model. The factors in the resulting model were then entered into a final model to prevent list-wise exclusion of patients with missing data for factors not being considered. All analyses were performed with SPSS software (SPSS: An IBM Company, version 22.0, IBM Corporation, Armonk, NY, USA), with P < .05 deemed to be indicative of statistical significance throughout. The NHS Blood and Transplant holds the database for transplant procedures in the United Kingdom, but they had no role in the study design, data analysis, data interpretation, or writing of this report. The corresponding author had full access to all data. This project was registered as an audit with University Hospitals Birmingham NHS Trust (audit identifier; CARMS-12578). 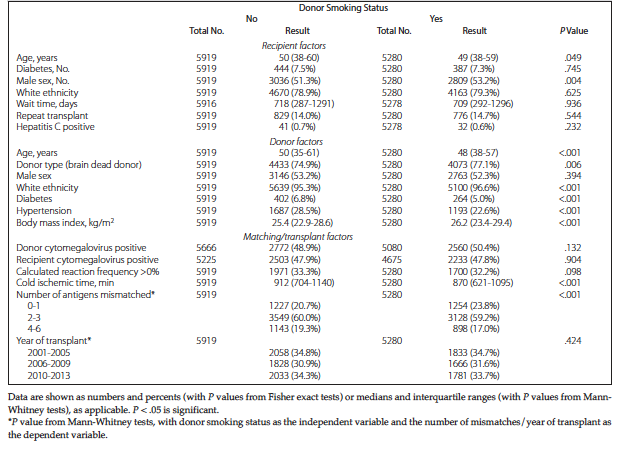 After exclusions (see Figure 1), data were available for 11 199 patients, of whom 5280 (47.1%) received organs from donors who had been classified as smokers. Donors who had reported being smokers were found to be significantly younger than those who did not smoke (median age of 48 vs 50 years; P < .001), and these organs went to significantly younger recipients (median age of 49 vs 50 years; P = .049). Smoking versus nonsmoking donors were also significantly more likely to be of white ethnicity (96.6% versus 95.3%; P < .001) and more likely to be donors after brain death (77.1% versus 74.9%; P= .006). 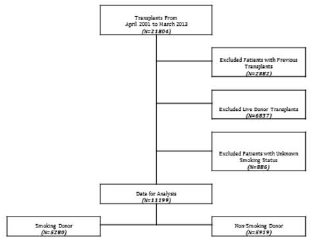 The full comparisons of patient demo­graphics between smoking and nonsmoking donors are shown in Table 1. In total, there were 1098 deaths in the cohort over a median follow-up of 46 months after kidney transplant (interquartile range, 14-84 mo). The 3 most common causes of death among all deceased-donor kidney recipients were cancer (n=269, 24.5% of all deaths), infection (n=268, 24.4% of all deaths), and cardiac related (n=211, 19.2% of all deaths). Overall, 579 deaths occurred in recipients who received a deceased-donor kidney from a smoker and 519 deaths occurred in recipients who received a deceased-donor kidney from a nonsmoker. There was a trend for more cardiac- and cancer-related deaths in recipients who received a kidney from a deceased-donor with versus without smoking exposure, but they were significantly less likely to die from an infection-related cause (see Table 2). In a subset analyses, the mortality risk associated with deceased-donor kidneys from smokers was magnified in recipients with diabetes. In kidney transplant recipients with diabetes, mortality risk from receiving kidneys with versus without smoking exposure was 22.9% versus 15.3% (P = .003) com­pared with mortality shown for kidney transplant recipients without diabetes (10.9% vs 9.8%; P = .049). Our univariate survival analyses (see Table 3) found overall patient survival to be significantly shorter in patients who received organs from smoking donors (hazard ratio of 1.12, 95% confidence interval [CI], 1.00-1.25; P = .044). At 5 years posttransplant, patient survival rates were 88.2% in recipients of deceased-donor kidney allografts from smokers compared with 89.8% in recipients of deceased-donor kidney allografts from nonsmokers (see Figure 2). No significant associations were detected between donor smoking status and either death-censored graft survival (P = .845) or overall graft survival (P = .468). Multivariate survival analyses were then performed to account for potentially confounding factors. Increasing recipient and donor age and recipient diabetes were found to be significant independent predictors of overall patient survival (all P < .001). After we accounted for these factors, the effects of deceased-donor smoking status remained significant, with higher mortality in patients who received deceased-donor kidney allografts from smokers (hazard ratio of 1.16, 95% CI, 1.03-1.29; P = .011). The relationships between donor smoking status and both death-censored graft survival (P = .354) and overall graft survival (P = .060) remained nonsignificant in multivariate analysis. Our population-cohort study, the first contemporary analysis of the effects of deceased-donor smoking exposure on kidney allograft recipient outcomes, suggests that transplant of kidneys from donors with a history of smoking is associated with decreased survival in recipients. This observation was consistent for deceased-donor kidney recipients after adjustment with multivariate Cox models. No differences were observed in graft survival between donor kidneys from smokers versus nonsmokers. Our findings raise important questions regarding the pathophysiology of donor smoking effects on recipient mortality and suggest that donor smoking status should be considered when risk stratifying end-stage kidney disease patients for transplant with deceased donor kidneys. From the available cohort of 38 390 patients, 41.9% (n=16 071) had a history of cigarette smoking. In a Cox regression model, a moderate association was observed between deceased-donor smoking history and risk of graft loss (hazard ratio of 1.05; P<.05) and death (hazard ratio of 1.06; P<.05), but no associated risk was observed for recipients of donors with history of intravenous drug use and alcohol dependency. As previously highlighted, the historical nature of this study limits its direct application in the contemporary era of transplantation and immuno­suppression. However, it is interesting that, despite the time interval between these studies, our findings mirror those of this earlier analysis and suggest that there may be some underlying pathophysiology for recipients who receive deceased-donor kidneys from individuals with smoking history. Although we excluded living kidney donors from our analysis, it should be noted that similar results have also been observed in this setting.7 Underwood and colleagues performed a retrospective analysis of 602 living kidney donors and their respective recipients to explore the effects of donor smoking on recipient outcomes. They found that, after controlling for other factors, recipients of a kidney from a living donor who smoked had lower overall survival (hazard ratio of 1.93, 95% CI, 1.27-2.94; P = .002) but not lower kidney allograft survival (hazard ratio of 1.19, 95% CI, 0.71-1.97; P = .515).7 Further work is warranted to evaluate the effects of smoking in living kidney donors on outcomes in recipients. This is especially important as there is a lack of uniformity regarding evaluations of living kidney donors who smoke. A survey of the evaluation and selection of living kidney donors in the United States found that 7% of transplant centers routinely excluded smokers.8 Most programs who responded to the survey accepted current smokers (71%), but one-third of these required the donor to commit to smoking cessation before donation (2% of centers required verification of smoking cessation). Another 20% of programs did not have any formal smoking policy. International guidelines for living kidney donors are heterogeneous with respect to their guidance in the evaluation of potential donors who smoke, but none discuss the potentially adverse implications for recipients who receive a kidney from someone with previous smoking history.9 Other documented effects of donor smoking from single-center studies include an association with decreased kidney allograft excretory function10 and development of chronic allograft nephropathy11 in kidney recipients. Although we have a clearer association from a number of studies of the adverse posttransplant outcomes related to kidney allograft recipients who smoke, many studies are limited due to their historical nature. However, these studies have demonstrated that smoking by kidney recipients after transplant is associated with an increased risk of death, overall graft loss, death-censored allograft loss, and cancer.11-18 It is important to note that approximately one-third of kidney allograft recipients are smokers, with 90% of patients continuing to smoke post­operatively.4 Although the overwhelming benefits of smoking cessation are well-documented in the general population, there are no data to support similar efficacy of smoking cessation after kidney transplant. Kasiske and Klinger have reported the benefits of smoking cessation 5 years before transplant, showing a reduction in overall graft failure (adjusted relative risk of 0.66; 95% CI, 0.52-0.85; P<.001) primarily driven by less deaths.19 Further studies are warranted to assess the benefits of smoking cessation strategies posttransplant; in their absence, it would seem rationale to encourage smoking cessation for potential living kidney donors and kidney allograft recipients. There are several limitations of our analyses that must be considered in the interpretation of our results. There are likely to be numerous recipient-related confounders that have an impact on mortality after kidney transplant that we were unable to factor in (eg, recipient smoking, lifestyle, dialysis vintage). Missing data (and misclassification bias) also have implications on our analyses; this factor is an inherent bias in epidemiologic analyses such as ours and led to the exclusion of living kidney donors from our analysis. From the aspect of smoking, there is a lack of dose effect and inability to ascertain whether smoking exposure was active or not among deceased donors. In addition, registry data do not have information regarding recipient smoking; its absence is a limitation in this analysis as there is a potential for interaction between recipient and donor smoking status. The lack of access to variables such as rejection, delayed graft function, and creatinine levels meant limited exploration of allograft outcomes. Although our primary interest for this analysis was mortality and graft survival, these other parameters would be of interest to explore and the ability to link this dataset to more granular data such as creatinine and proteinuria would be important. The strong association of both of these parameters with all-cause and cardiovascular death in the general population could suggest a causal link that explains our study findings if we speculate that kidneys from smokers have inferior posttransplant allograft function, with subsequent suboptimal estimated glomerular filtration rate and/or proteinuria contributing to increased recipient mortality risk. An inability to ascertain the biological link between donor smoking and recipient mortality justifies a significant degree of caution in the interpretation of our results but also supports further investigation in this area. To conclude, this is the first study to corroborate previous literature reporting an independent link between kidney donor smoking exposure and recipient-related mortality, although no link was identified with graft survival. Further work is essential to investigate this observation, as our preliminary results cannot distinguish between causality versus association, and any biological effects must be clarified. Our findings require validation in other large population-based cohorts; they also require basic/translational research to explore the mechanistic pathophysiology that may underlie this association. In the context of continued disparity between supply versus demand of kidney allografts for transplant, the use of kidneys from individuals with smoking exposure is likely to continue. Although smoking cessation should be actively encouraged in all potential living kidney donors (for both donor- and recipient-related benefits), we suggest that use of kidneys from deceased donors with smoking exposure should be risk stratified for potential candidates who may be considered as high-risk recipients (eg, patients with diabetes, previous cardiac history). However, regardless of medical comorbidities of recipients, it is likely that deceased-donor kidney transplant with kidneys from smokers will still have superior outcomes versus remaining on dialysis, and potential candidates should be counseled appropriately with regard to this. Bilano V, Gilmour S, Moffiet T, et al. Global trends and projections for tobacco use, 1990-2025: an analysis of smoking indicators from the WHO Comprehensive Information Systems for Tobacco Control. Lancet. 2015;385(9972):966-976. Health & Social Care Information Centre. Statistics on Smoking, England 2014; http://www.hscic.gov.uk/catalogue/PUB14988. Accessed February 18, 2016. NHS Organ Donor Register. http://nhsbtmediaservices.blob.core.windows.net/organ-donation-assets/pdfs/nhs_organ_donor_register.pdf. Corbett C, Armstrong MJ, Neuberger J. Tobacco smoking and solid organ transplantation. Transplantation. 2012;94(10):979-987. Lin SJ, Koford JK, Baird BC, et al. Effect of donors' intravenous drug use, cigarette smoking, and alcohol dependence on kidney transplant outcome. Transplantation. 2005;80(4):482-486. Legendre C, Canaud G, Martinez F. Factors influencing long-term outcome after kidney transplantation. Transpl Int. 2014;27(1):19-27. Underwood PW, Sheetz KH, Cron DC, Terjimanian MN, Englesbe MJ, Waits SA. 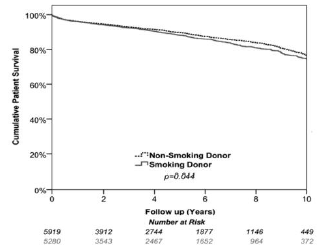 Cigarette smoking in living kidney donors: donor and recipient outcomes. Clin Transplant. 2014;28(4):419-422. KDIGO Guidelines. Summary of published living kidney donor guidelines. http://www.kdigo.org/clinical_practice_guidelines/LivingDonor/Summary%20of%20Published%20Living%20Kidney%20Donor%20Guidelines.pdf. Accessed February 18, 2016. Heldt J, Torrey R, Han D, et al. Donor Smoking Negatively Affects Donor and Recipient Renal Function following Living Donor Nephrectomy. Adv Urol. 2011;2011:929263. Zitt N, Kollerits B, Neyer U, et al. Cigarette smoking and chronic allograft nephropathy. Nephrol Dial Transplant. 2007;22(10):3034-3039. Cosio FG, Falkenhain ME, Pesavento TE, et al. Patient survival after renal transplantation: II. The impact of smoking. Clin Transplant. 1999;13(4):336-341. Matas AJ, Payne WD, Sutherland DE, et al. 2,500 living donor kidney transplants: a single-center experience. Ann Surg. 2001;234(2):149-164. Sung RS, Althoen M, Howell TA, Ojo AO, Merion RM. Excess risk of renal allograft loss associated with cigarette smoking. Transplantation. 2001;71(12):1752-1757. Hurst FP, Altieri M, Patel PP, et al. Effect of smoking on kidney transplant outcomes: analysis of the United States Renal Data System. Transplantation. 2011;92(10):1101-1107. Kheradmand A, Shahbazian H. The role of pretransplant smoking on allograft survival in kidney recipients. Urol J. 2005;2(1):36-39. Ponticelli C, Villa M, Cesana B, Montagnino G, Tarantino A. Risk factors for late kidney allograft failure. Kidney Int. 2002;62(5):1848-1854. Danpanich E, Kasiske BL. Risk factors for cancer in renal transplant recipients. Transplantation. 1999;68(12):1859-1864. Kasiske BL, Klinger D. Cigarette smoking in renal transplant recipients. J Am Soc Nephrol. 2000;11(4):753-759. Orth SR, Ogata H, Ritz E. Smoking and the kidney. Nephrol Dial Transplant. 2000;15(10):1509-1511. Kabani R, Quinn RR, Palmer S, et al. Risk of death following kidney allograft failure: a systematic review and meta-analysis of cohort studies. Nephrol Dial Transplant. 2014;29(9):1778-1786. McCue JM, Lazis S, John Cohen J, Modiano JF, Freed BM. Hydroquinone and catechol interfere with T cell cycle entry and progression through the G1 phase. Mol Immunol. 2003;39(16):995-1001. Kalra R, Singh SP, Kracko D, Matta SG, Sharp BM, Sopori ML. Chronic self-administration of nicotine in rats impairs T cell responsiveness. J Pharmacol Exp Ther. 2002;302(3):935-939. Sopori ML, Kozak W, Savage SM, Geng Y, Kluger MJ. Nicotine-induced modulation of T Cell function. Implications for inflammation and infection. Adv Exp Med Biol. 1998;437:279-289. Wan F, Dai H, Zhang S, Moore Y, Wan N, Dai Z. Cigarette smoke exposure hinders long-term allograft survival by suppressing indoleamine 2, 3-dioxygenase expression. Am J Transplant. 2012;12(3):610-619. Moffett JR, Namboodiri MA. Tryptophan and the immune response. Immunol Cell Biol. 2003;81(4):247-265. Cai H, Harrison DG. Endothelial dysfunction in cardiovascular diseases: the role of oxidant stress. Circ Res. 2000;87(10):840-844. Messner B, Bernhard D. Smoking and cardiovascular disease: mechanisms of endothelial dysfunction and early atherogenesis. Arterioscler Thromb Vasc Biol. 2014;34(3):509-515. Cohen JB, Bloom RD, Reese PP, Porrett PM, Forde KA, Sawinski DL. National outcomes of kidney transplantation from deceased diabetic donors. Kidney Int. 2016; 89:636-647. Acknowledgements: We are grateful to the UK Transplant Registry for the availability of these data. This work was presented as a Free Communication at the British Transplant Congress in Glasgow, UK (February 2016).The authors have no sources of funding for this study and have no conflicts of interest to declare.